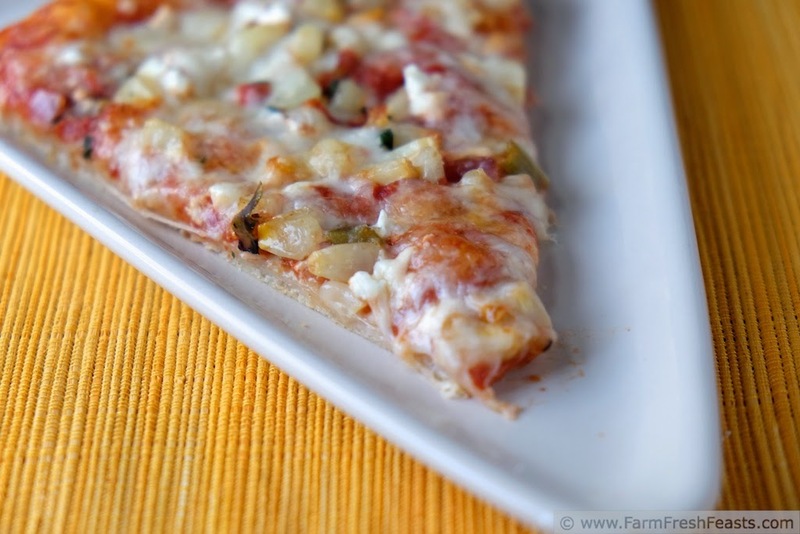 Fresh corn, roasted Hatch chiles, and feta cheese top this vegetarian summer pizza. Even though the humans are remarking on the unseasonable weather this summer, the vegetables are going about their business as usual. It had [please notice past tense] been so unusually NOT hot & muggy that I really never considered grilling our Friday Night Pizza using the Mr BarBQ Grill Stone Pizza Set** that I won on Barry's blog Welcome to the Cookout!™. Speaking of winning . . . .
Did I mention that I won that prize? I did? Good. As with all giveaways, someone's going to win the entire prize package of kitchen tools and cookbooks I've been reminding you about lately. It may as well be you. I can't enter, and besides I already won a pizza set. I'm good. You can't win the #IceCreamWeek giveaway unless you enter. The contest ends on August 31st--enter here! When I happily had the combination of leftover Fresh Corn & Hatch Chile Sauté and a need for pizza toppings last week, well, the pizza practically threw itself together. All we had to do was eat it. Preheat oven to 425 degrees Fahrenheit. 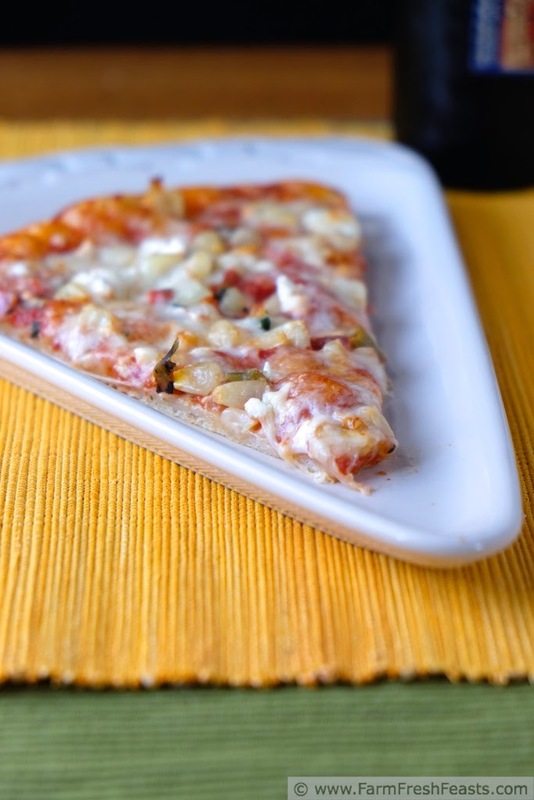 If you have a pizza stone for your oven, preheat it as well. If not, use an ungreased cookie sheet and don't worry about preheating the cookie sheet.. If using dough, stretch it out on an oiled piece of parchment paper. If using a pre baked crust, follow package directions. 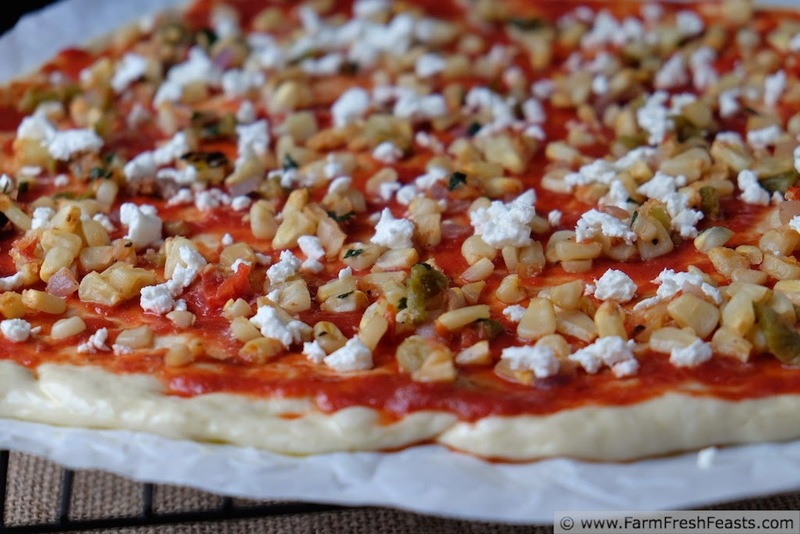 Spread dough with tomato sauce and top with vegetables. 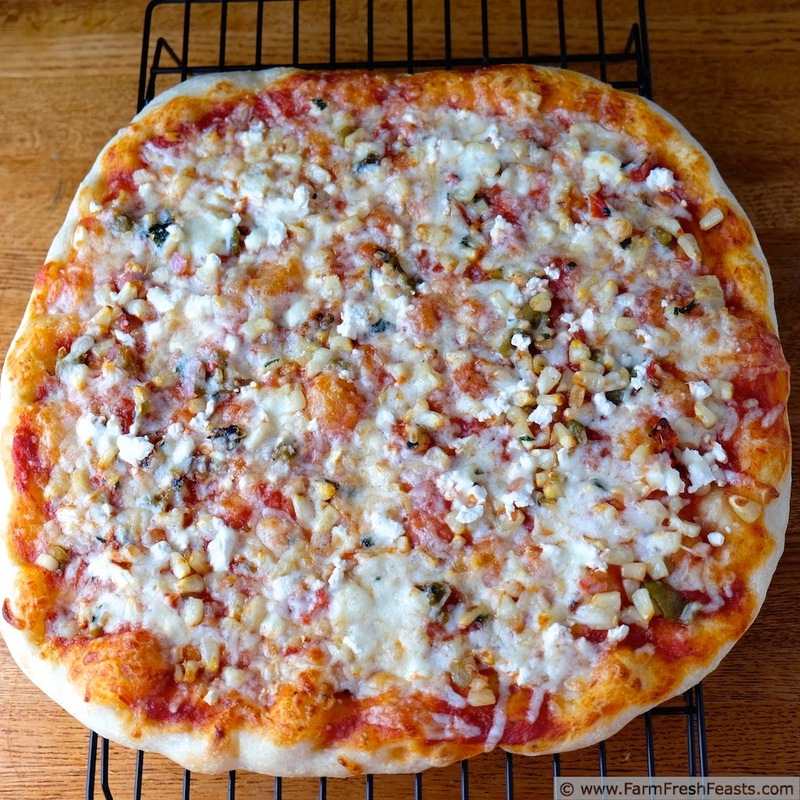 Scatter feta cheese across the top, then finish by covering with shredded mozzarella cheese. Bake for 5 to 8 minutes, then shimmy the parchment paper out from under the crust, and bake directly on the stone or cookie sheet for another 3 to 5 minutes until the cheese is bubbly and browning. Cool on a rack, then slice and serve. **You'll notice I've not shared a pizza made using this grill set. Two reasons for this omission--1) it's not been stinkin' hot so I haven't minded turning on the oven and 2) my grill is just barely big enough to hold the stone. In Barry's review you can see plenty of grill around the stone. His grill is bigger than mine, not that I have grill envy. However, when grills go on sale we're investigating the possibility of getting a larger one--when we do so I'll grill pizza and blog about it. Stay tuned. Don't stop singing weird Al. 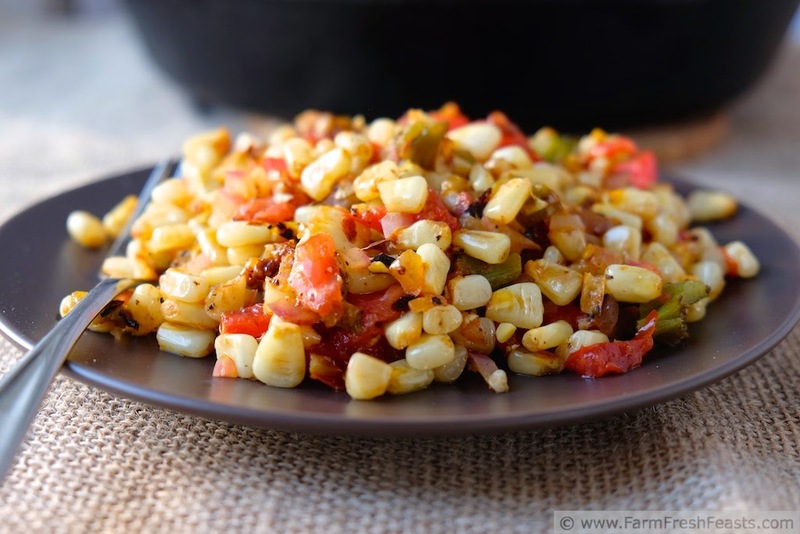 Now you've just given me reason to make lots of the corn and hatch chile saute. My mom is coming to town on Friday and a pizza seems like a lovely and easy dinner. Two meals in one. This is just one of the reasons I love you. Bringing me hatch chiles right before launching all these hatch chile recipes is yet another. I'm glad to share the Hatch chile bounty with you! I made this and I absolutely loved every single bite. It was fantastic. Thank you for circling back and letting me know--much appreciated!